You have added Pleated Chiffon Colorblock Hem Maxi Dress in Pale Pink/Dusty Coral into shopping cart. FINAL SALE. This simple style is a great casual glamorous look for day or night. The Pleated Chiffon Colorblock Hem Maxi Dress is fully lined to the mid-thigh. It is made of a pleated chiffon fabric and has a classic maxi cut, adjustable spaghetti straps, and colorblock detail at the hemline. An included braided belt wraps around the waist and can be tied off to the side. Pair this dress with flat beaded sandals and a boho chic headband for a casual day look. Or dress it up with wedges or strappy heels for a dressier style. Details: Fully lined to mid-thigh. Adjustable spaghetti straps. 75% silk, 25% polyester. Lining: 100% polyester. Hand wash cold water separately. Color will bleed. No bleach. Hang to dry. Small measurements: Length from top of bust to hemline: 51". Bust: 33". 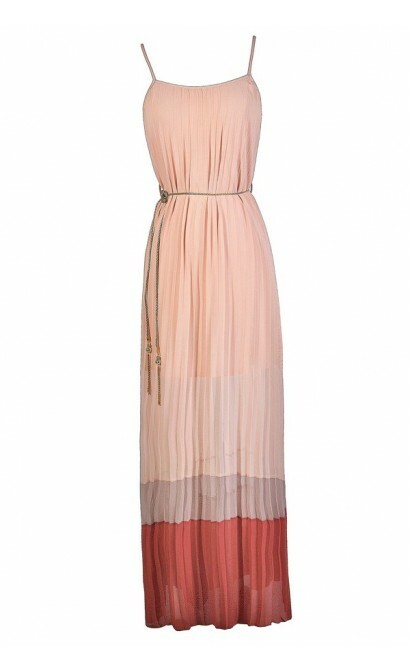 You have added Pleated Chiffon Colorblock Hem Maxi Dress in Pale Pink/Dusty Coral into Wishlist. You have added Pleated Chiffon Colorblock Hem Maxi Dress in Pale Pink/Dusty Coral for Stock Notification. You have set Pleated Chiffon Colorblock Hem Maxi Dress in Pale Pink/Dusty Coral as a loved product. 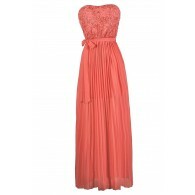 You have removed Pleated Chiffon Colorblock Hem Maxi Dress in Pale Pink/Dusty Coral as a loved product.